Over the past two years, Get Moving Orange County has engaged with the community in a proactive public outreach effort resulting in three public forums, community feedback, and extensive stakeholder input. From the beginning we recognized that additional solution ideas could be derived from the many ideas collected through our outreach effort. On February 8, 2018, the Transportation Corridor Agencies proposed a twenty first idea at the Joint Transportation Corridor Agencies (TCA) Board Meeting. This new idea, referred to as “the hybrid”, blends Idea 12 and Idea 14, two of the public’s suggested solutions. The hybrid idea is a viable solution to provide regional traffic relief to South Orange County, demonstrating TCA’s continued commitment to finding a traffic relief solution for the region. The hybrid would extend Los Patrones Parkway in Rancho Mission Viejo from Cow Camp Road to connect with Avenida La Pata in the vicinity of the Prima Deschecha Landfill. 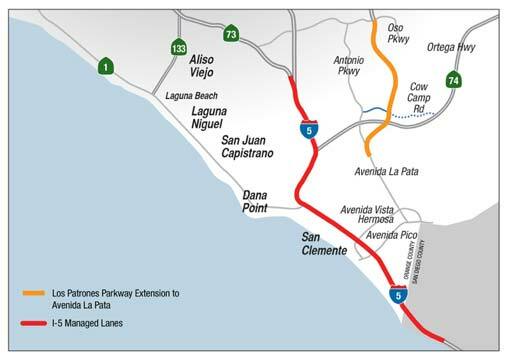 The hybrid additionally incorporates adding managed lanes in the median of the Interstate 5 Freeway from State Route 73 to Basilone Road south of the San Diego County Line. The hybrid idea has been added to the list of seven alternatives that were identified in the Project Screening Document that was released to the public on December 14, 2017 and are now being studied as part of the Caltrans project initiation process. The long-term schedule for the South Orange County Traffic Relief Effort involves ongoing discussions with the community, stakeholders, environmental organizations and elected officials as we move forward towards the formal environmental review process. We encourage the public to remain engaged and participate in this effort to insure your community’s needs and priorities are considered. A public scoping meeting and a public review of the draft environmental document and its technical studies will be part of the formal environmental review process. The public scoping meeting is anticipated in early 2019.